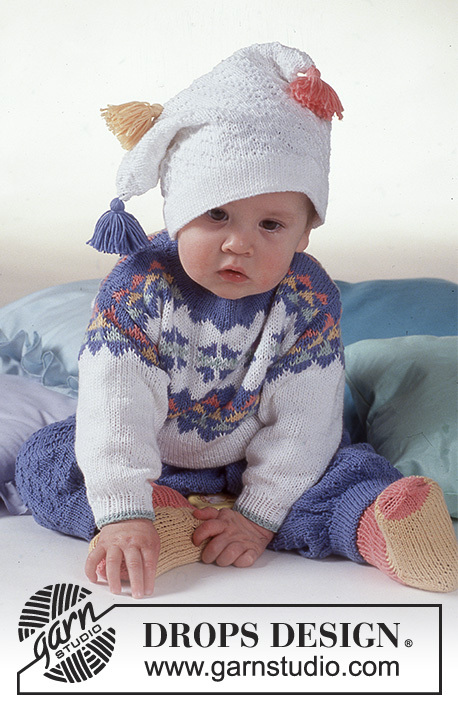 Go to original pattern for design DROPS Baby 2-14. 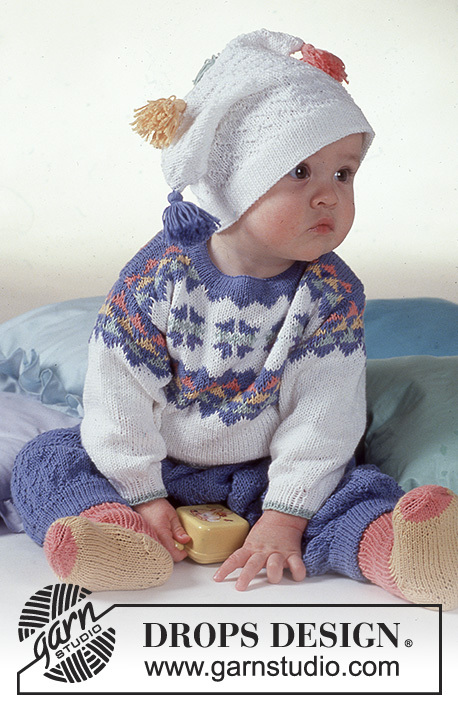 DROPS jumper with star pattern, trousers, hat and socks in “Camelia”. Front and back piece: Worked in the round on circular needle. 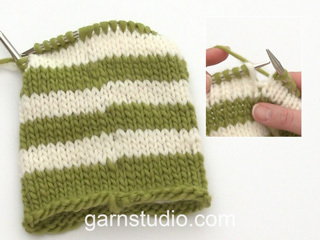 Cast on 120-132-144-158 sts on circular needle size 2.5 mm with mint and work 3-3-3-4 cm Rib. Change to needle size 3 mm and continue in stocking st, at the same time inc 0-0-0-10 sts evenly on first round = 120-132-144-168 sts. 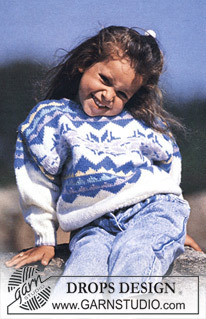 Remember the knitting tension. When piece measures 9-12-15-17 cm, continue in M.1 – beg by arrow in diagram, work pattern on front piece, beg by arrow again and work pattern on back piece. At the same time when piece measures 14-15-19-20 cm divide piece in 2 and complete front and back pieces separately. Front piece: = 60-66-72-84 sts. After M.1, work M.2, and then M.3. Continue as follows: Size 3 + 6/9 months: M.4 and complete piece in blue, size 12/18 + 24 months: 12 rounds of M.4 and complete piece in blue. When piece measures 22-25-29-31 cm cast off the middle 14-16-18-22 sts for neck and dec on every other row to shape the neckline: 2 sts twice, 1 st twice. Cast off remaining sts on shoulder when piece measures 26-29-33-35 cm. Back piece: = 60-66-72-84 sts. Continue as described for front piece, but after M.3 cast off 4 sts mid back for split and complete each shoulder separately. Left shoulder: Cast on 4 new sts and work these in Rib and blue = 32-35-38-44 sts. When piece measures 24-27-31-33 cm dec to shape the neckline on every other row: 13-14-15-17 sts 1 time, 1 st twice. Cast off remaining sts when piece measures 26-29-33-35 cm. Right shoulder: as left shoulder, but after 2 cm make 1 buttonhole in centre of the 4 inc sts. 1 buttonhole = cast off 2 sts and cast on 2 new sts on return row. Cast off remaining sts on shoulder when piece measures 26-29-33-35 cm. = 58-62-68-72 sts. When piece measures 11-15-16-17 cm work M.3 (place a pattern repeat mid upper sleeve) and continue as described for body pieces. Cast off , sleeve measures 16-20-22-23 cm. Assembly: Sew shoulder seams. Fasten band at bottom of split. Pick up approx 80-90 sts on needle size 2.5 mm with blue and work 2 cm stocking, at the same time make a buttonhole after 0.5 cm in line with the other on body piece, P 1 round = folding edge, 2 cm stocking st (remember buttonhole). Fold neck double towards WS and fasten. Set in sleeves and sew on buttons. Knitted from waist down. Cast on 130-140-150-150 sts on circular needle 2.5 mm with blue and work Hem. Change to needle size 3 mm, at the same time inc 30-20-30-30 sts evenly = 160-160-180-180 sts. Continue as follows from mid back: 80-80-90-90 sts of M.5 (M.5 and M.6 in blue), 80-80-90-90 sts of M.6. 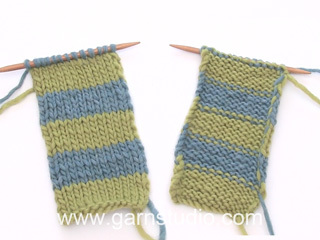 Remember knitting tension. When piece measures 16-18-20-21 cm inc mid back and mid front on both sides of middle st on every other round: 1 st 7 times (4 inc per round) = 188-188-208-208 sts. Now cast off the inc 14 sts mid front and mid back = 160-160-180-180 sts, divide the piece and work each leg separately. Right leg: = 80-80-90-90 sts. 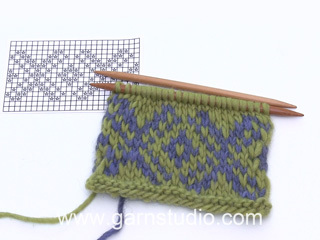 Continue on double pointed needles in pattern. 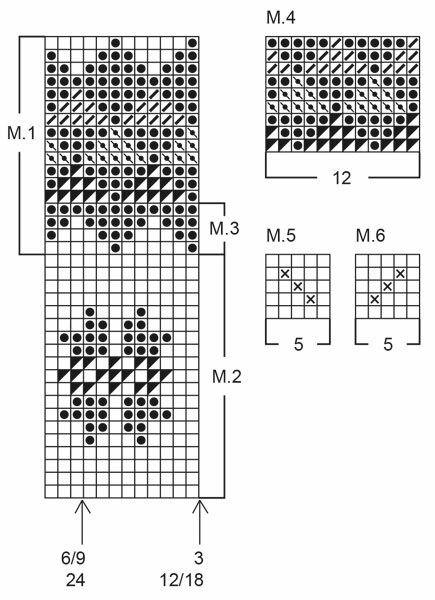 When piece measures 35-39-44-49 cm dec 34-28-36-32 sts evenly on round = 46-52-54-58 sts. Change to needle size 2.5 mm and work Hem. Cast off. Left leg: as right leg. Sew split between legs. Fold all edges double towards WS and fasten. Insert string at waist. To fit head circumference: 42-46-48-50 cm. Hem: 3 cm stocking st, P 1 round (= folding edge, measure piece from here), 3 cm stocking st. Cast on 100-110-115-120 sts on double pointed needles size 3 mm with white and work Hem (see above). Continue in M.5 until piece measures 19-21-23-25 cm, cast off. Sew tog at top. 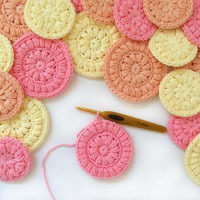 Make 4 tassels in 4 different colours and place evenly along seam. 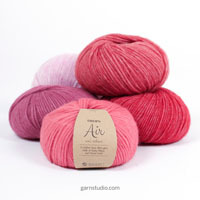 SOCKS: See Babydrops 2, pattern no 11. Work 6-7-7-8 cm Rib instead of 10-11-11-12 cm. 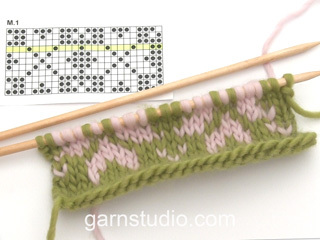 Use Salmon until heel, change to yellow. Change back to salmon for dec for toes. Hej Jeg er ved at strikke bukserne af model Ø-020-by. Dog er jeg stødt på et problem. Jeg ved simpelthen ikke hvad der menes med “der tages 30 m ud jævnt fordelt på p4p”. Hvad menes der med p4p? Hej Johanne, det ser ud som om at det er "å" som er blevet til 4... Det vil sige der skal stå jævnt fordelt på pinden. God fornøjelse! Hallo Leileika, Bedankt voor het doorgeven. Ik heb het telpatroon er zojuist bijgezet. Hej Kitte. Ja, M.5 mangler, vi skal faa det lagt paa. Du laver de 4 spidser paa denne maade: Sy en søm midt på hovedet, Sy 4 duske i hver sin farve jævnt fordelt på sømmen = saadan jeg forstaar det, saa lukker du bare sömmen i één og fordeler duskene hen over sömmen, der kommer kun 2 spidser men duske.